Once again the sadness of death strikes us, having stolen one of our most beloved sons away too soon.We do not complain although we are sad. We are a people who live in hope. 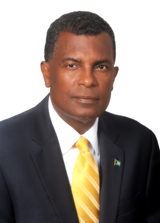 I join with the Grand Bahama Community in expressing condolences on the passing of Pastor Wilbur Outten. I want to express my public thanks to his family both biological and the extended church family for his civic leadership, and the example of fairness and equanimity which he set in the Freeport and the wider Grand Bahama Community. Under his leadership, the church engaged in significant outreach to all communities and was a centre for learning, teaching and civic exchange.I deeply appreciate his role in promoting a civil polity.That extended hand was instrumental in explaining our immigration policies and other public policy matters to the wider public.I am deeply appreciative for his help.